You know why I have mixed feelings about Final Fantasy XIII? It’s not just the long corridor I recall running along in for hours. Or my dark secret that I don’t despise Hope. No. It’s that Final Fantasy XIII destroyed my 80 GB PS3. Person of Interest’s season 5 premiere just had to remind me about my long-dead console. Person of Interest’s 13 episode final season kicked off Tuesday night, and I’m already stressed at the prospect of losing all the cast members, on top of losing one amazing, too-smart-for-TV show. For fans, it’s going to be a bittersweet ride watching Team Machine try to survive and save its own AI, The Machine, in a war against the corrupt AI, Samaritan, as the latter takes over the world and dooms mankind—rigs elections, invades privacy, labels just about everyone as deviants with no real distinction between the mundane and credible assessments, and kills anyone perceived as a threat to its safety. There are lots of ethical questions which have been the focal point of the series for the last four seasons, and that continued in the premiere of its fifth. I highly recommend the show to everyone with an interest in artificial intelligence, and just an all round brilliant sci-fi outing—honestly, it’s one of the best shows on television. The Person of Interest writers are usually lauded for really knowing their stuff, able to work their knowledge into utilizing real world fixes and technology. Last night, the original 2006 ‘fat’ PlayStation 3 made an appearance in the episode titled “B.S.O.D”. About 300 of them, actually. Things get dicey when everything starts to overheat but it’s all saved by another interesting tidbit the writing team found—by cooling it down using liquid nitrogen which can be found on the streets of NYC as, “...the phone companies use it cool phone lines throughout the city,” as character Reese explains. So yep, why not here. Sidenote: I’ve actually seen these tanks on NYC’s streets. Unsettling things. It was so exciting! All those little PS3s working in unison, lit up with their adorable blue lights to save The Machine. They got some red lights of death (would have been funny if they were YLOD) when they were on the fritz. Right then I had a flashback. That moment reminded me of my own lost 80 GB. I had finally arrived at the open world of Gran Pulse after 60+ hours of moving from point A to point B in Final Fantasy XIII when the game froze, taking my PS3 with it. The only option I received was to have it replaced with a slim 160 GB as it was under warranty, but I’m still convinced to this day that it was kept by Walmart for its backwards compatibility value. As you can tell, I’m still salty. 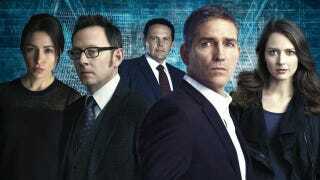 In any event, Person of Interest is back and it’s going to be fantastic (seriously, they continue to slay with their choice of soundtrack alone. Just listen to that greatness of a track in “No Wow” by The Kills which started the episode with a bang). The show’s already making my heart ache because I’m really nervous for the characters, and The Machine itself, particularly witnessing its relationship with its creator, Harold Finch (and yeesh, Michael Emerson is a brilliant actor able to deliver a range of emotions to elicit same in his viewers. He can act the hell out of a scene in what amounts to a solo performance of a man talking to a computer screen, and that alone can make you teary). I’m going to miss the show’s cleverness in moments like these as with the PlayStation, using cultural quips and current, last gen and evolving technology to try to better understand all the technical know-how—and to imagine future possibilities of artificial intelligence—laden in its script. Even though mine met an untimely demise, Person of Interest shows that the Playstation 3...well, it only does everything.